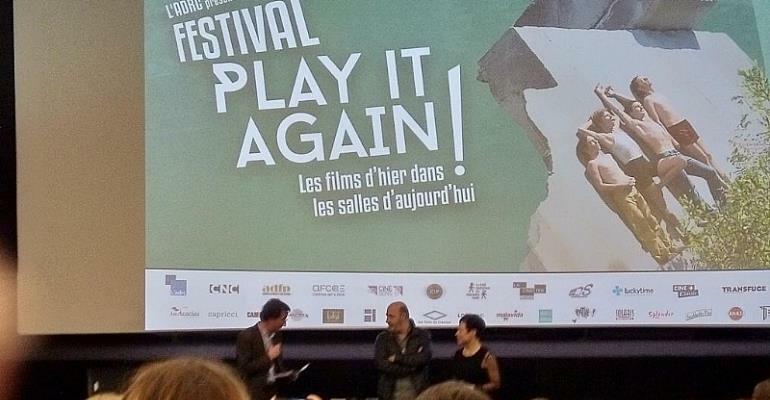 Independent or art-house cinema hall owners in France are strutting their stuff in their fifth annual week-long festival showing 16 golden oldies and called, Play It Again Sam . The name comes from a misquote attributed to Michael Kurtiz 1942 classic Casablanca. It is also the name of a Woody Allen film of 1972. More than 150 cinemas all over the country take part and screen this special programme until 9 April 2019 organised by the ADRC, the French regional film development agency working with the Association of French Classics Distributors. The festival kicked off in Paris at the Left-Bank cinema, the Grand Action which was overhauled in 2005 by its director, Isabelle Gibbal-Hardy, who is also president of the Independent Parisian Cinema network (CIP). Buster Keaton's silent black and white 1923 Our Hospitality marked the occasion, accompanied by a live trio of piano, double bass and percussion. The film has been restored by French specialists, Lobster Films. The resulting effect is better than botox. Well-known across the Atlantic, French film maker Cédric Klapisch ( When the Cat's Away , 1996, Pot Luck , 2002, My Piece of the Pie 2011 etc.) is this year's special guest partner at the Play it Again Sam Festival. He has his own connection with old films through a platform called La Cinetek which he set up with like-minded French filmmakers. As well as being a film buff, François Thirriot owns halls in the Ardennes in the east of France, and is a board member of the ADRC. One of his favourite films in this year's festival is Robert Enrico's 1965 Les Grande Gueules ( The Wise Guys ) starring Lino Ventura and Bourvil, another is Federico Fellini's La Strada. As a 20 year-old, Thirriot hung out in the Latin Quarter where many of the independent halls are concentrated. His family began their business of running cinemas in Charleville-Mézières and Sedan in the early 1900s, at around the start of World War I.
Cinema attendance has had its ups and downs since then. Thirriot remembers after a dip about 30 years ago, things picked up significantly. He remarks that cinema isn't old hat today either. In the highly competitive Parisian arena, Gibbal-Hardy has introduced a more business-like approach to managing art-house cinema halls, and encouraged other members of the CIP network to run a pre-paid card valid in each cinema where they show some 300 films a year. This she said this has made a difference. Some of the smaller halls may be slightly less comfortable and lacking in some of the modcons. However, watching a film in one of these theatres which have their own style is a more distinct and more personal experience, perhaps even a Parisian experience. Alongside regular programming, 50 percent old films, 50 percent new releases, Gibbal-Hardy organises one event after another to catch film lovers' and professionals' attention, for all ages. The Lightship , a 1985 film by Jerzy Skolimowski, starring Robert Duvall and Klaus Maria Brandenauer closes the festival on 9 April 2019 at La Grande Action cinema in Paris.